Exchanges at Knighton, Bucknell and Clun are in the process of being upgraded to Superfast Broadband using fibre-optic cables. Because premises in the Redlake Valley are too far away from whichever of those exchanges supplies them, homeowners and businesses are unlikely to see any benefit in the immediate future. All you are eventually guaranteed – maybe by the end of 2016 - is a minimum download speed of 2 Mb, which is not particular good nowadays, although the government is looking into ways of increasing that guaranteed minimum to 5 Mb. That doesn’t mean that you won’t get better than the minimum guarantee as the next few paragraphs explain. Shropshire Council has responsibility for the upgrade programme through its Connecting Shropshire operation. At the moment it has plans to upgrade about 85% of premises in the county to fibre-based broadband, but the summer of 2015 will see an extension planned for the roll-out of high speed broadband to about 95% of premises. It is far too early to know which, if any homes and businesses in the Redlake Valley will benefit. There are also plans to connect the remaining 5%. No information on this is available yet although other methods of supplying broadband are being tested by government for roll-out to that 5%. The worst case scenario is that the government issues vouchers worth, maybe, £1,000 to help homeowners and business take out a satellite broadband contract. Satellite broadband is the least favourable option. It has its uses, but can often prove to be expensive and slow. In case we remain unlucky and end up in the remaining 5% and potentially saddled with an inferior technology, a number of residents are working to devise a possible Plan B. One option being explored at the moment involves the use of another government scheme, the Superfast Connected Cities programme, which has been extended to Shropshire and provides eligible premises with vouchers worth up to £3,000. To be eligible you need to be an “enterprise” of some sort, which usually means a self-employed person or a home-based business, but it can also include charities, social enterprises and even a parish or town council. The residents’ survey of broadband last summer demonstrated that about 60% of premises in and around the valley are home to an “enterprise” according to the scheme’s definition. The scheme allows vouchers to be used collectively to build a broadband network. There are over 100 premises in the valley, so 60 vouchers at £3,000 each can generate a lot of money if aggregated. If that happened there would be nothing to prevent purely residential premises taking advantage of any network built this way. This is not an ideal solution as it involves a lot of work, and the scheme may even close or run out of money before we know what Connecting Shropshire’s plans are for us, but it’s important that we keep our eyes and ears open for all possibilities as we don’t want to be left in the 20th Century while everyone else enters the digital age. Without decent broadband, houses will be more difficult to sell, home-based businesses and families with children will be less inclined to move here, and we will probably see some leave. 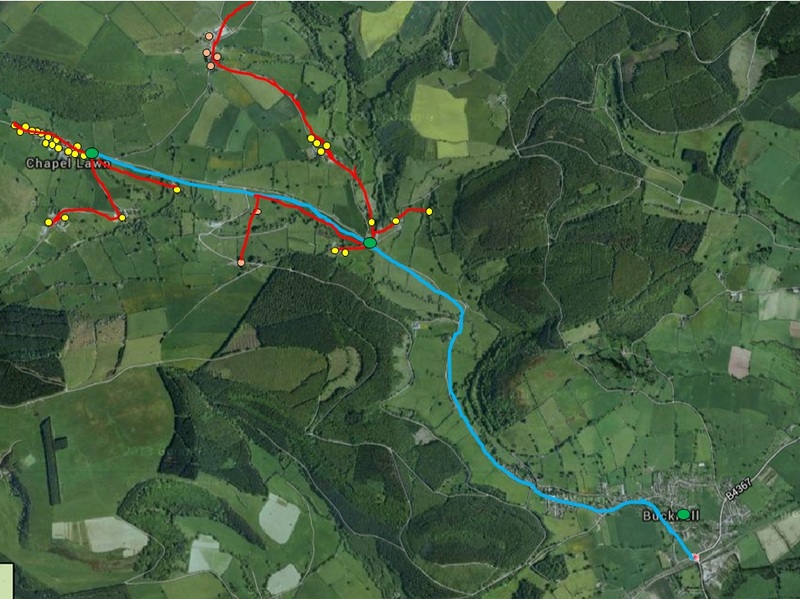 In order to present a business case to Shropshire Council for extending fibre broadband to the area, surveys were carried out in late May of premises with business or self-employed people in the parts of Redlake Valley served by the 01547 line from Knighton and 01588 from Clun. The figures were compelling, and possibly even slightly understated as a few properties may have been overlooked and not quite every business or self-employed person was available to provide a signature. 01547 from Knighton: 41 properties with land lines were identified in the survey area of about 1.4 square miles. 31 of those properties (78%) are home to 35 businesses or self-employed people asking for the line to be upgraded. Although not surveyed, at least 3 purely residential premises also want to see high speed broadband here, taking the percentage to 85%. 01588 from Clun: 34 properties with land lines were identified in the survey area of about 1.9 square miles. 23 of those properties (68%) are home to businesses or self-employed people asking for the line to be upgraded. Although not surveyed, at least 3 purely residential premises also want to see high speed broadband here, taking the percentage to 76%. Copies of the survey were sent to Shropshire Council's Leader, Keith Barrow, Cllr Steve Charmley at Shire Hall who has responsibility for broadband roll-out, Nigel Hartin, our own County Councillor, James McVicar, Clun Town Council chairman, and Philip Dunne MP. This is the situation following the recent exercise to assess demand for high speed broadband for each of the three exchanges supplying the Redlake Valley and nearby. We have just heard that no-one in The Redlake Valley will be supplied by BT Openreach's fibre-broadband within Shropshire Council's second phase of broadband roll-out. The Council has now contracted with BT to supply 4,000 more premises with fibre broadband which leaves at least 15500 homes and businesses in the county with no known solution other than a guarantee of 2Mb and no known way yet of delivering that. This is a great disappointment for our community given the high level of demand that exists for faster broadband and such a high proportion of home-based businesses and self-employed people - over 65% of premises in our area are home to an enterprise of some form or other, and a great many of them are increasingly dependent on broadband for their livelihoods. We don't know exactly what Shropshire Council will do next although they have always said that once they have contracted with BT they will enter another procurement exercise to provide for more of the remaining premises in the county. Rather than simply sit and wait for the outcome of that exercise, a number of us are exploring options to access fibre broadband, or mixed fibre and wireless broadband using other sources of funds, including aggregated broadband vouchers aimed at businesses. These are funded by government, and when used together might be able to attract a broadband network builder. Purely residential properties would also be able to make use of this even though they aren't eligible for vouchers. Jim Rogers is talking to BT; Patrick Cosgrove is talking to a couple of reputable network builders who supply rural areas in other parts of the country; Jim, Sarah Jameson and Robert Humphreys have arranged a meeting on 7th August with Connecting Shropshire to look at options. Nigel Hartin, our local county councillor, has agreed to attend in order to provide support. If/when we find out what other options exist we will be in touch with you again. Although we may eventually make some recommendations, as we have no authority to take decisions some form of consensus might be required if there is more than one choice. Of course we may be unsuccessful in finding any other solution, or Shropshire Council may come up with something that is perfectly acceptable. The point is that we are making sure that as many options as possible are explored. In the event that we are successful and anyone did not want to make use of new provision, they would be free to continue with whatever service they now use, or none. It hardly needs to be stated that this is a highly unsatisfactory situation. Attempts have failed to make use of the government's business voucher scheme to pay for a high speed broadband network in the valley. The reason for this is explained more fully in the next article. We must now wait for Shropshire Council to announce its next steps for extending broadband in what it calls “Phase 2b” – probably later this year. The Council currently has about £11m to spend and that figure will increase substantially with contractual repayments and savings from their initial BT contract for broadband deployment. Government announcements on broadband policy are also anticipated this autumn, including the outcomes of trials of other ways of bringing broadband to rural areas and an increase in the guaranteed minimum download speed, although concerns still linger that that a satellite solution may be favoured. These announcements may influence what Shropshire Council decides to do with its broadband money. In the absence of anything positive, our advice is to struggle on with whatever speeds you have until you know what the Council's plans are. If they do end up supplying the valley with high speed broadband, because of the criteria for the use of their money, whatever is provided is likely to be better than commercial offers of satellite and fixed wireless services that you may receive in the meantime. One problem is that existing BT infrastructure is in the form of three separate exchanges supplying the valley – one from Bucknell (01547), one from Knighton (also 01547) and one from Clun (01588). If Shropshire Council’s Phase 2b contract is with BT, there is no telling at present whether one, two or three of those exchanges would be upgraded nor which would come first. If not all were upgraded, that could create a two-speed community if other solutions were not found. It's important that Shropshire Council recognises this if BT does end up providing us with a solution. If the Council contracted with a different provider, the existing telephone line layout becomes irrelevant and a whole valley approach would probably be adopted. If we end up looking for our own solution again, clearly a whole valley approach would be preferable. 2. Why the voucher scheme has come to nothing. Earlier this year we told you that BDUK, the government body responsible for rural roll-out, had extended a city-based voucher scheme for small firms and self-employed people into some rural areas, including Shropshire. Vouchers were worth up to £3,000 and the rules permitted their aggregation for the construction of broadband networks in places that BT had decided not to supply. Patrick Cosgrove, Robert Humphreys, Sarah Jameson and Jim Rogers tried to find ways of using these vouchers to bring broadband into the valley. This involved discussions with BT, other network builders and operators, Shropshire Council and Digital Birmingham, the organisation that oversees the voucher scheme. Rules prevented BT Openreach from being involved in the voucher scheme, and and although we found companies that could work with us and might have worked together to provide a combination of fibre and wireless broadband, other complications arose. The biggest barrier turned out to be voucher eligibility. Although it did not say it in the voucher publicity, quite by chance some way into the process we discovered that farms that had received 15,000 Euros or more in farm subsidy payments across the last three years are ineligible. Because so many of the businesses in the valley are farms, this drastically reduced the amount that might have been raised by aggregating vouchers. We asked Shropshire Council if some of their broadband money could be used to compensate for this loss but it seems that they were unable to do that, presumably because they are still deliberating on how to use their broadband fund. The voucher idea is not completely dead for us, because although the national budget is running out, government may extend the scheme which could conceivably bring changes to its rules. However, prospects are not good at present and there are other complications not worth detailing here, and anyway, national events may present something better. The one positive thing to come out of this is that we have found a good fibre network builder who might be prepared to work with us if the need arises. It hardly needs saying that the supply of what is now an essential service should never have been this complicated. 3. Shropshire Council's latest position statement. "We now have a balance of BDUK funds of £6.68m that can be used together with the Marches LEP’ Local Growth Fund allocation of £5.02m. We intend to use this funding towards a further procurement exercise. At the same time we will continue to explore options with our partners BT as part of the process, but not under exclusivity and with no obligations on the council. The unallocated funds provide Shropshire Council with a clear opportunity to reassess the wider market as outlined in the December paper. It is anticipated that the process of ‘soft market’ testing will encourage ‘Procurement competition’ and the use of new technologies which will be essential to providing greater reach to those most impacted by the lack of fibre broadband coverage." Thank you to everyone who attended Thursday’s meeting or sent their support and apologies. Here is a summary of where we are. Afer a meeting of a few residents last year it was agreed that I should contact BT with a proposal to connect properties on the Bucknell exchange to superfast broadband (24 – 80Mbs) using the “fibre to cabinet” solution used by BT in the rest of the country. Patrick Cosgrove would contact other providers with a proposal for a scheme that would connect up the whole of the Redlake Valley in one go. After 10 months, BT Openreach have come back with a quote for the additional funding they would require to connect up Chapel Lawn. I have attached an rough plan (hover your cursor over the plan above for a larger version). The red lines are existing copper phone wires, the blue lines is new fibre and the green dots are two new green fibre cabinets. Yellow dots represent properties connected at 24 – 80Mbs and pink dots represent properties connected at 10 – 23MBs (not “superfast”). The quote is for £102,857! However, Shropshire Council have indicated that they could fund £1700 per property connected at 24+Mbs; this would be £47,600. It appears the main cost in the scheme is to dig a fibre into the road from the edge of Bucknell to Lower Lye. If the community could get permission from the landowners to “mole plough” the cable across private land to the Lower Lye, the project may then become affordable. Once there is fibre down to Chapel Lawn, BT or any other provider can connect to the network to extend superfast broadband further up the valley. Patrick objected to the scheme because it only connected a third of Redlake Valley and so would be divisive. He suggested an alternative where we try to persuade BT to extend their fibre to The Pentre and then build a wireless network to the rest of the valley using the existing “lines of sight” route set up by Jentech 10 years ago now disused. · James Middleton would sound out the landowners to see if they might be willing to allow mole ploughing some of the route. · I would get a revised quote from BT Openreach. · I would try to set up a meeting with Shropshire Council, BT, Patrick and the wider community to explore an extension to the fibre to the Pentre. · Patrick would try to find a company willing to build a wireless network across the rest of the valley. I will continue to keep you posted of developments and we will call another meeting of everyone when I can get Shropshire Council and BT to attend. If you have any comments or questions please don’t hesitate to contact me. After prolonged negotiations with BT and Shropshire Council at the end of 2016 the proposed plan for connecting Chapel Lawn valley back to Bucknell with Superfast Broadband was agreed. Shropshire Council would fund the majority of the scheme and the rest would be met from Basic Broadband Vouchers, which residents have now been awarded. In February 2017 BT Openreach signed a contract with Shropshire Council to complete the work no later than March 2018. 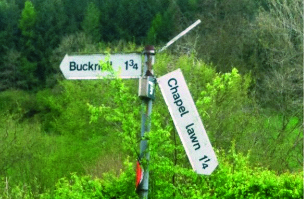 Despite promises from Openreach that Chapel Lawn would be treated as a priority, weekly communications have had to be maintained to keep the project moving. The 5 additional and 1 repair telegraph poles will be installed second week of February. The mole plough contractor will receive the BT trunking second week of February and then will complete the fibre link back to Bucknell. The cabinet at the Lye is due to be installed w/c 19th February. The fibre has to cross under the road at the edge of Bucknell and will require a short road closure this has been applied for but permission will take in excess of 6 weeks taking us into March. Openreach are now giving me weekly updates so I will endeavour to keep everyone updated. The cabinet is being installed this week at the Lye. Unfortunately this necessitates the road closure, but I hope it will only be intermittent between 9 and 5. Spine completion at the edge of Bucknell will start next week and last a few days. Again they need the road closed, but hopefully it will also be intermittent. Pole Erection – Most of the poles have now gone up. There is one still to go in at Squire Farm, but this will be done concurrently to the above. The mole ploughing will take 4-5 days, but is waiting on permission from the landowners after the recent weather water logged the ground. inally the cabling and jointing will take 5-10 days subject to the completion of all of the above. This will connect everything up ready for you to upgrade and I will write to you again immediately this is done. Remember, to get the benefits of Superfast Broadband you have to apply to your Internet service provider to upgrade, but you may find there little or no cost for this. Cab - Bucknell 6 – Power is due to be completed at the end of the month under a road closure. Once powered and power tested the cab will go into our live to live process for review (where we move customers with other suppliers who use Openreach as a supplier over to the new cab without affecting service). Downtime has to be agreed with other telecom’s operators if live services are found with other suppliers (early indications are that there are services that will need to be moved). Once this has completed the cab will be commissioned and available to order. I have asked Openreach to email me as soon as residents are able to place orders and I will relay this out to everyone. There seems to be a very limited range of suppliers at the moment who are prepared to connect Fibre to the Premise. BT Residential and BT Business will and two or three less well-known companies, but when the time comes I would advise contacting your current provider first. The new FTTP (Fibre to the Premises) connections have finally been released to the wholesale market and so you can now place orders for superfast broadband. You should contact your current Internet Service Provider first to see if they can upgrade you. If you have to change ISP the best deal I have seen is currently with BT for an unlimited 50 Mbs download inc line rental for £29.99 (but this only if you are a new customer) (and it goes up after 18 months. Ed.). But you might want to do your own shopping around. Properties connecting via the cabinet at the Lye are still waiting on completion and I will be writing to them in due course. After two years of battling and cajoling, Chapel Lawn has finally gained Superfast Broadband. Twenty houses in Chapel Lawn can now get “fibre to the premises” with speeds of up to 330 Mbs, although it’s cheaper to opt for a lower speed such as 50 Mbs. Sixteen houses around the Lye and up to Pentre Hodre can now get “fibre to the cabinet” with speeds up to 80 Mbs, although this speed drops off the further you are away from the new cabinet. The project was carried out by BT Openreach subsidised by grants totalling £60,000 from Shropshire Council and central government. This now puts us in the top 3% for broadband speed across the UK. All this was achieved without the need for any financial contribution from residents. However, it could not have happened without the kind permission of Mrs M Grimes, Mr T Morris, Mr J Middleton, Mr & Mrs Ogden and Mrs B Wilding for allowing cabling to be dug across their land, so many thanks to them! I would encourage everyone to take the opportunity to upgrade their service. Depending on your service provider and contract it may actually be cheaper than your current service and BT repay a proportion of the subsidy back to Shropshire Council for each property which upgrades. Much of the higher Redlake Valley was upgraded to Superfast wireless broadband last year by Secure Web Services (SWS). Early feedback from users has been very positive reporting consistent, reliable speeds and good customer support. Chris New, SWS, has told me they are expecting to extend coverage to the Pentre shortly. If you have any questions, please ring me on 530258. Many thanks to Jim for all the ‘battling and cajoling’ in getting BT and Openreach to co-ordinate their efforts. We are all (those of us who use the internet) very grateful to everyone who has worked to get the Superfast Broadband into the valley. BS.